Dr. Moya has owned and operated Family Care Specialists since 2001. She is a dedicated individual who simply enjoys taking care of people. One of her favorite medical philosophies is, "Treat the patient and not just the disease." Her foremost responsibility is in raising her daughter Elise, however she also enjoys photography. She is also fluent in Spanish. After graduating from the University of Denver in 1984 with a Bachelors of Arts in Biology she went on to earn her Doctorate degree of Medicine from the University of Colorado Health Sciences Center in 1991. 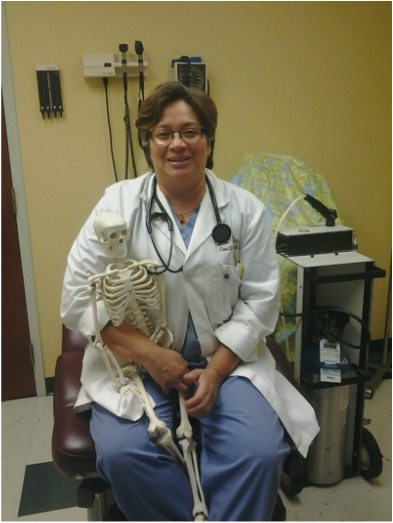 She completed her Family Practice Internship at the Naval Hospital in Jacksonville, Fl. Following that she completed her residency at the Naval Hospital in Charleston, SC., and finally completed the Clinical Faculty Development Program at the University of Washington, School of Medicine in 1998. Dr. Moya is the primary medical provider at Family Care Specialists, however she holds four prominent positions at Colorado State University of Pueblo (CSUP). Those include: Clinical Instructor and Adjunct Faculty in the Department of Exercise Science and Health Promotion, Medical Director for both the Department of Outdoor Pursuits and the Department of Athletic Training, and the Lead Team Physician for all CSU-Pueblo sports. In addition, she is also a Commander in the United States Naval Reserve and holds the position of Senior Medical Officer. ​ Neonate, infant, and child care. ​ Bioidentical hormone replacement for women and men.